Reaching Coorg - the breathtaking land of the 'Kodavas', located atop the Sahyadri Mountain range, is not a problem at all. It is well-connected to all the major cities and states of India through an extensive communication network. If you plan a vacation to this place, there are various feasible options for you to choose from; according to your preference, convenience and budget. In the following lines, we have provided information on how to reach Coorg. 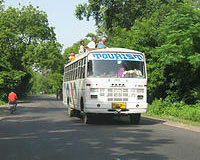 The nearest airport to Coorg is Mysore, which is 120 km from the hill station. The second nearest is in Mangalore, which is located at a distance of 135 km from it, followed by the Bangalore Airport, located about a distance of 250 km. You can easily fly from any place in India or abroad, to one of these airports, and then board a private taxi, bus, or car for reaching Coorg. If you plan your tour by road, Coorg has a well-connected network of roads that connects it to most of the important cities in Karnataka. The roadways connect cities like Mysore (120 km), Hassan (115 km), Mangalore (135 km), Bangalore (250 km) to Coorg by a well-maintained system of roadways. You can enjoy the scenic beauty of the place to the fullest, while traveling by road, either in a public carrier or in your own vehicle. The railhead situated nearest to Coorg is in Mysore, at a distance of 55 kms, and is a drive of two and a half hours from the place. Mysore has an extensive network of railways that easily connects it to the rest of India. One can even avail trains, in the nearby cities of Mangalore or Hassan for getting to Coorg.